This handy tape cutter belongs in every toolbox or junk drawer. It takes the frustration out of paint jobs, moving, or any project that requires tape. Designed to fit snugly on tape rolls, the design neatly slices off pieces of tape evenly—and easily. Different sized cutters ensure there’s a Tadpole for the size of tape you’re using—like duct, electrical, or packing. This combo pack gives you one of each size. Dimensions: 1" Tape Cutter: 1" x 2" x 1"; 1.5" Tape Cutter: 1.5" x 2" x 1"; 2" Tape Cutter: 2" x 2" x 1"
We were moving to a different state and we were packing boxes ourselves. 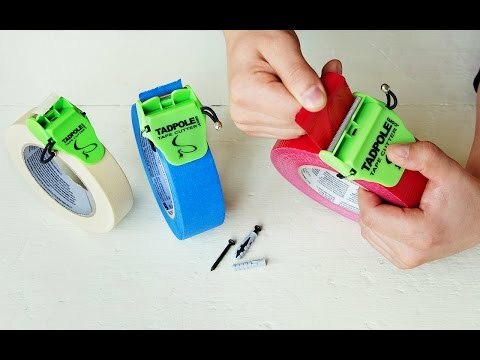 These tape cutters saved us time and frustration! Easy, fast, and frustration free! Ever struggled to find the end of a tape roll, or to cut off pieces? The Tadpole tape cutter will put an end to that. 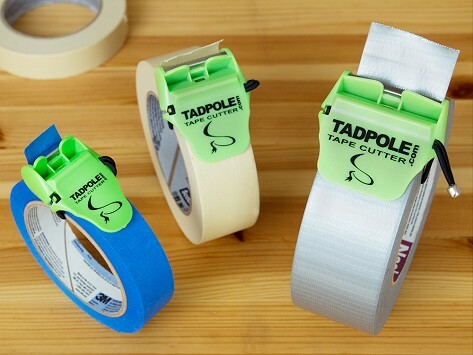 This time (and sanity) saver gives you a clean, straight piece of tape every time. Its bungee-like cord attaches the blade to a roll, staying flush against the tape—like a less-bulky tape gun that’s even easier to use. Lee Mallahan III created Tadpole after fighting to get straight pieces of painters tape for numerous glass door panes. Besides giving tape users everywhere a much-needed break, Tadpole gives back, too. It’s Made in the USA by partners from The Louisiana Association for the Blind. Tadpole is low profile enough to keep on any roll in your toolbox or kitchen drawer—electrical, duct, masking, painters. And when one roll is finished, Tadpole goes right onto the next. Now you can stop using scissors, a box cutter, a knife—or worse, your teeth—to get a piece of tape.